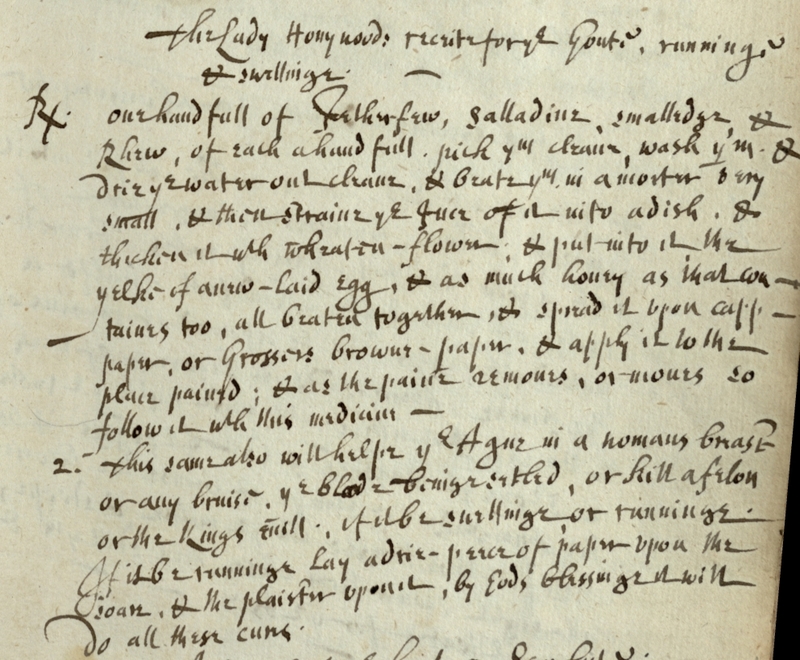 In my research I have found that other examples of this recipe appearing throughout the English Civil War era call this ointment “The Angel Salve,” others still the less evocative “Yellow Salve,” but there are only a handful of pre-1700 versions that include an expansion on the origin myth of the salve in which an angel descended on a “religious house” in Germany to exclaim the many virtues of the ointment. 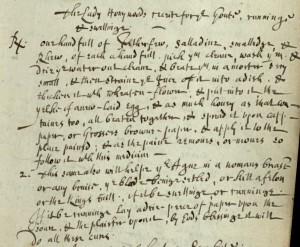 The most notable of these expansions is found in Philatros’ Natura Exenterata (1655),  a recipe which is likely to come from Anne Dacre Howard (1557/8-1630), a rough contemporary of Elizabeth Downing, mother of Calybute, and this version of the recipe, of the more than thirty recipes I have examined, remains the closest to Elizabeth Downing’s. This entry looks at these two versions with relation to another pre-Civil War example in an attempt to hone the nature of their connection and to bring another print text into the network of the CPP manuscript. The third pre-1640 example is from an anonymous text, A booke of soueraigne approued medicines and remedies, first published in 1577. 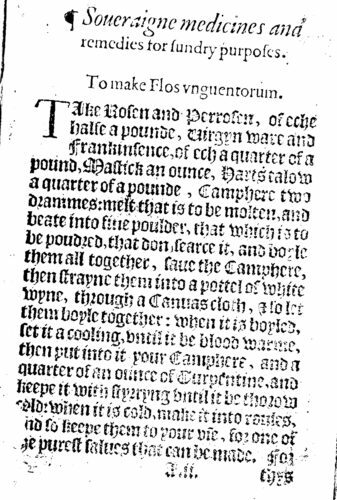 Ultimately, my argument is that the 1577 version is the source text for the Dacre recipe, as it is very close to it in many details. The ways that the Downing example diverges from Soueraigne approued medicines are in line with the Natura text, but then the Downing adds further variances and eliminates expansions, which suggests that the Dacre manuscript is its source, not vice versa. 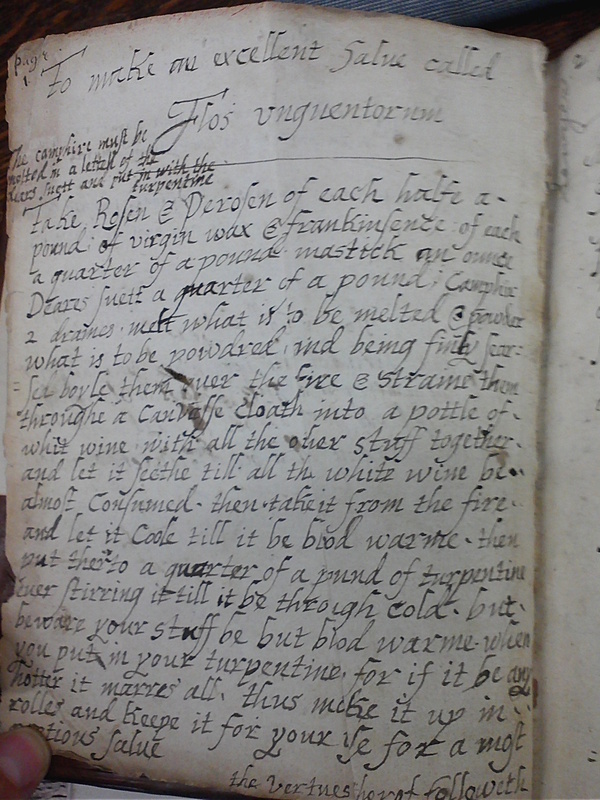 As I have mentioned before one major difference between the Natura Exenterata and the Downing recipe is where the virtues appear relative to the recipe, where the print text lists the many virtues first before giving the recipe and the manuscript lists them on a page following the recipe. This is the one way in which the Natura diverges from its source in a significant way in that Approued medicines lists the virtues on the verso of the first folio of the text, just as the Downing version lists the virtues on the recto opposite the recipe. 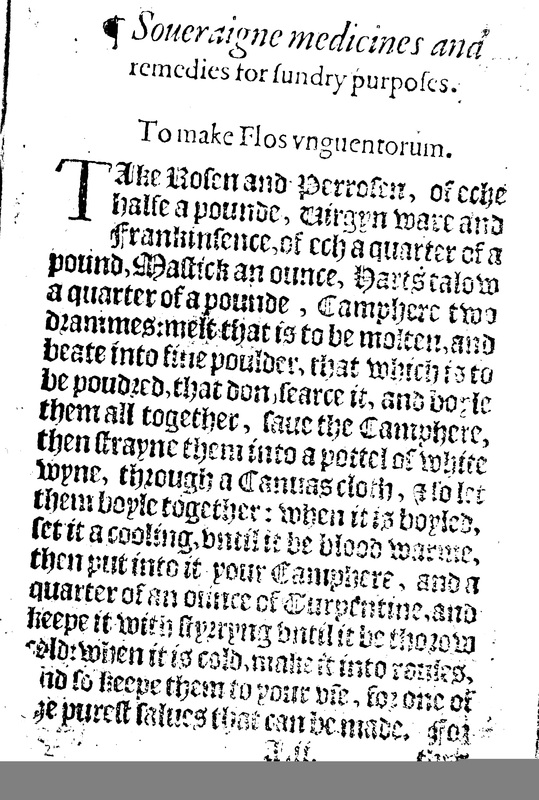 This correspondence and the manuscript’s use of “powder” (found in the 1577 text) rather than “pounded” as transcribed in the Natura Exenterata would suggest that the Downing is closer to the 1577 text, but in interpreting this information, we must remember that there is at least one missing text, the Dacre manuscript from which Natura was derived, and “pounded” suggests a mistranscription in the move into print from the minims of “poudred.” Similarly, the transposition in making the virtues first may have been a choice of the printer. The real evidence of the sourcing of the texts is the way that Natura embellishes on the 1577 version, expansions which then are contracted, replicated, or left out by the Downing manuscript. The most conspicuous of these expansions is the way that Dacre fills in the myth, which in the 1577 version is only “Thys Intret is called Flos vnguentorum for that it is supposed for hys vertues to haue come to knowledge by revelation.” In Natura Exenterata, the context of the revelation is given details in “this intreat is called flos unguentorum, for it cometh of Jesu Christi by an Angell to a house of Religion at the red hill in Almayn, which wrought there many marvails, and never had other medicine but this.” Also, a phrase from the 1577 “it healeth faster than any other” becomes in Natura “it healeth more in a sevenight then any other in a Month.” The Downing version includes neither of these, either in their short or long version, which as it would give the Dacre nothing from which to expand, indicates that the Downing is derived from the Dacre. Other changes made in Natura from the earlier print text that appear in Downing imply at least a close relation between the 1640 manuscript version and the manuscript source of the Natura. In the 1577 version, the ingredient is “Harts talow,” but in Natura it is “Harts suet,” which becomes “Deares suett” in the Downing version. The 1577 “searce it and boyle them all together” becomes in Natura “finely searsed, and boyle them over the fire,” which is then clarified in Downing’s “and being finely searsed, boyle them ouer the fire.” A direction in the anonymous text about making sure that the Camphire and Turpentine be added only when the rest is “cold as blood” or else “all is lost” is found in the list of virtues, which Dacre moves to its rightful place in the recipe, transformed to “no hotter than blood” or else “it marreth all your stuffe,” a move replicated in the Downing, becoming “but blood warme” and “it marres all.” The anonymous text calls the “Flower of Ointments” “one of the purest salues that can be made,” and the Dacre text changes to the “best and most precious salve that can be made,” which Downing shortens to “a most pretious salue.” The combination of the expansions in the Natura and the terse language in the Downing thus suggests that the Dacre has a closer proximity to the 1577 text, and that the Downing recipe is derived from the Dacre. Of course, as is getting to be the case in this series, there is a third possibility in that alongside the print texts from 1577 and 1655, and the 1640 manuscript and the implied Dacre manuscript source for Natura, we should consider the other implied manuscript, the one from which Calybute Downing copied his mother’s recipes. After all, it may be from Elizabeth Downing’s own receipt that words were mistranscribed, expansions were left out by some and copied faithfully by others, orders were changed, and phrases were clarified and confounded. We can determine, however, that the Downing and the Dacre recipes have an affinity, one that complicates and nuances the networks in front of us. The Historical Library of The College of Physicians of Philadelphia, Manuscript 10a214, pp. 1–2. Philatros, Natura Exenterata, London 1655, p. 332. Anonymous, A booke of soueraigne approued medicines and remedies, fol. A2r–A2v.